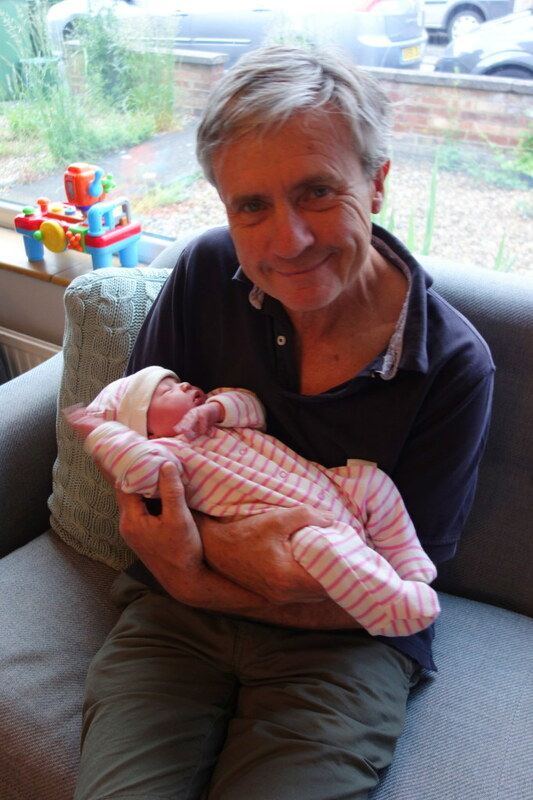 Announcing the rather speedy arrival of Evelyn Emily Woolfson. After a false start to labour a week beforehand (two hours of regular contractions Sunday evening and then nothing but braxton hicks all week.) I woke up on Sunday 4th June feeling uncomfortable. At 9am I was reading Jasper a story and asked him if he thought his brother or sister would be joining us that day. At 9.15am I had my first proper contraction so asked Luke to put the TENS machine on my back. Que the most painful part of my labour as Luke switched the machine on and pushed the boost button with the settings on full! I screamed and jumped half a metre into the air. During full on contractions I only ever got the settings as high as 4 and it goes up to 12! At 10am I was lying in bed with the cat imagining spending the best part of the day chilling out and resting between contractions. At 10.30am Luke rang my Dad to say be on standby for coming to look after Jasper (23 months old), I didn’t think it was quite time for him to set off yet so he started mowing the lawn at his! At 11am Luke made me a lean zone over the sofa, as with Jasper’s labour I wanted to be on all fours a lot, but after just one contraction in that position I felt loads of pressure so went to the loo and my waters broke with a pop. I asked Luke to ring Dad to come over (my parents live an hour’s drive away). I got into bed but on next contraction felt a huge amount of pressure again so went into the bathroom and more waters came. At this point I was gripping onto the new towel radiator with such force during contractions I thought I might rip it from the wall. Jasper’s labour had been intense but pain-free (read ‘My pain free labour and birth‘) but this was different. I kept thinking “I just need to get myself in the zone and then these contractions won’t feel as overwhelming.” I focused on my breath and relaxing my whole body rather than tensing against the contractions., which was really really hard as they were so powerful. My contractions were coming really close together and I could feel the pressure of the baby’s head so shouted to Luke to call 999! Our plan had been to go to the midwife led centre at Reading but it’s a 25 minute drive away. At this point as you can imagine I was rather vocal during contractions and Jasper was getting upset so I told Luke to take him downstairs and stick him in front of his Sing and Sign DVD. I ran a bath and 3 contractions later Evelyn’s head was out. 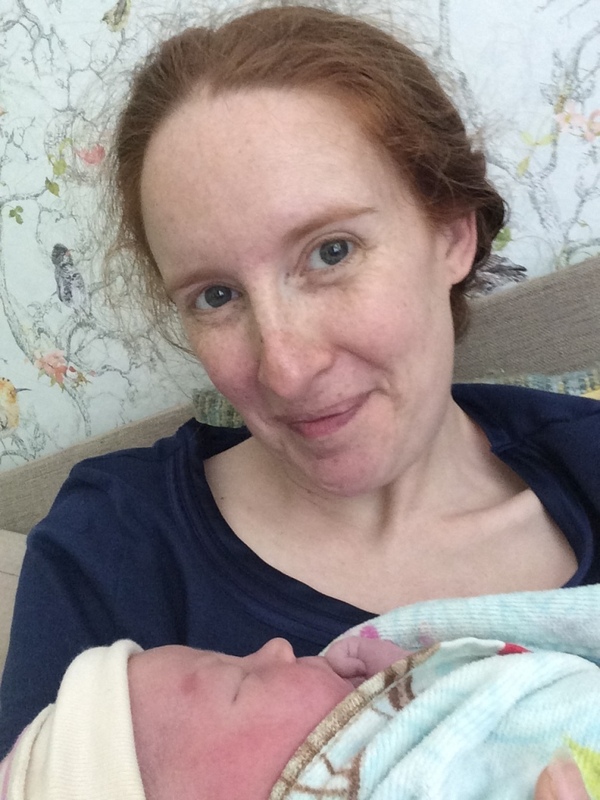 Luke was on the phone being talked through what to do to check baby and I were ok. Evelyn was born around 11.30am and Luke scooped her up from the water onto my chest. An ambulance arrived five minutes later but the paramedic had never attended a birth before. Luckily everything was fine with both me and Evie. The second ambulance arrived with two more paramedics and Luke took Evie for some skin on skin time while I birthed the placenta – that took 50 minutes and I gladly sucked my way through a tank of gas and air as the contractions were still full force! Dad arrived to take care of Jasper. Our local midwife could not be reached as her phone wasn’t working so we didn’t have a midwife with us until around 1ish. 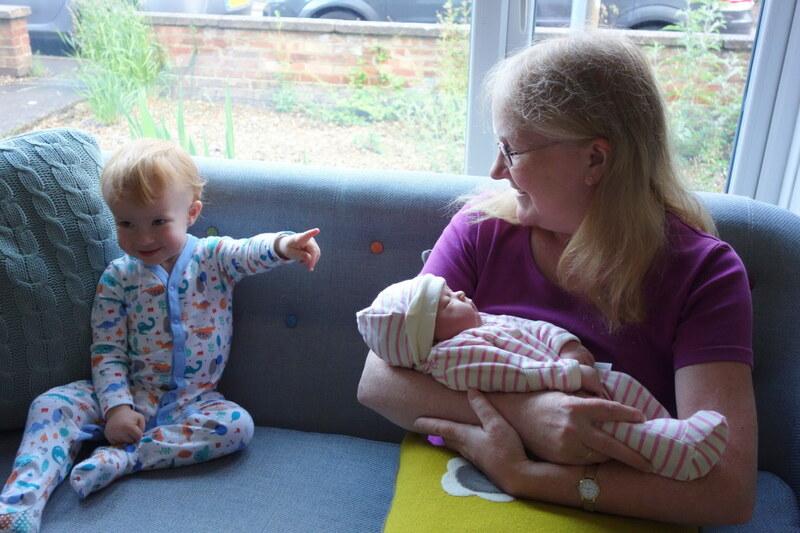 We had to go to Reading as I needed stitches but we were home again that evening to introduce Evie to her big brother and Grandparents. Epic day! I’m so grateful I teach hypnobirthing, I most definitely needed those skills to stay (relatively) calm and birth our little 7 lb 9 oz pumpkin without assistance. Although to be fair she birthed herself I was simply along for the ride. I only pushed once and that was when I could feel her crowning. It does make me think would the hour I spent trying to push Jasper out 2 years ago have been better spent just resting? I also think it’s interesting that with Jasper’s birth we visited the birth centre in Hampstead (we were living in London at the time) and every time I thought about giving birth I visualised the water birth room I wanted. I imagined myself arriving at the birth centre at the perfect point in labour to get straight into the birthing pool and on the day this is exactly what happened. I even got the midwife I had been asking for, both on my birth plan and during visualisations, even though I was told it was highly unlikely as she may not have been on shift or might already be with another couple. This time round we were unable to visit the birthing suite as they do not offer that at Reading (you get a DVD to watch instead so you do get to see what the rooms look like.) 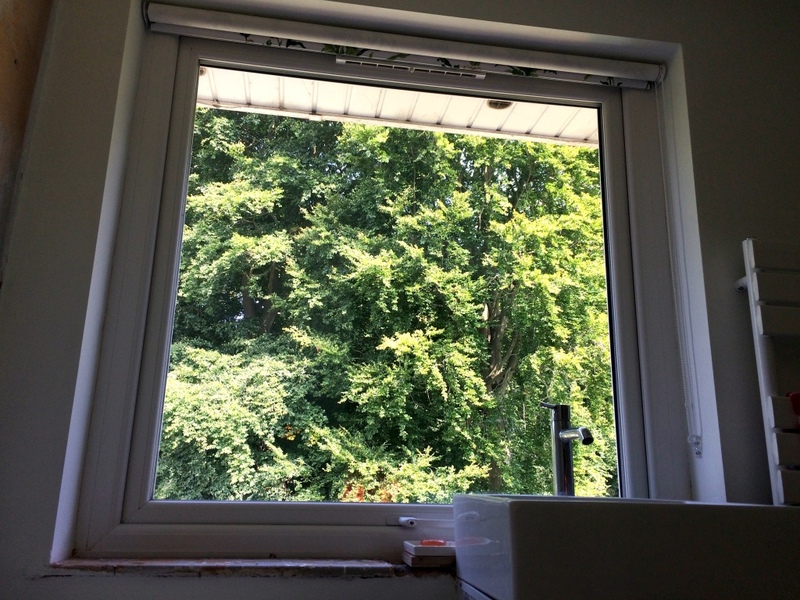 I couldn’t picture myself giving birth at the birth centre however much I tried but every time I sank into our new freestanding bath I thought “Oooooo wouldn’t it be lovely to pop the baby out while looking at our lovely woods!” (Photo above of the view from our bath tub.) And pop her out was exactly what it felt like I did. Even though Evie’s birth was not what I had planned and was not as calm as Jasper’s it still feels amazing to know that I trusted my body enough to let it birth rather than panicking and thinking that I needed to be anywhere else or do anything else in that moment. Lastly is it a coincidence that Jasper is incredibly chilled out and does a lot of things really slowly and Evie is generally more impatient and likes things to happen fast? 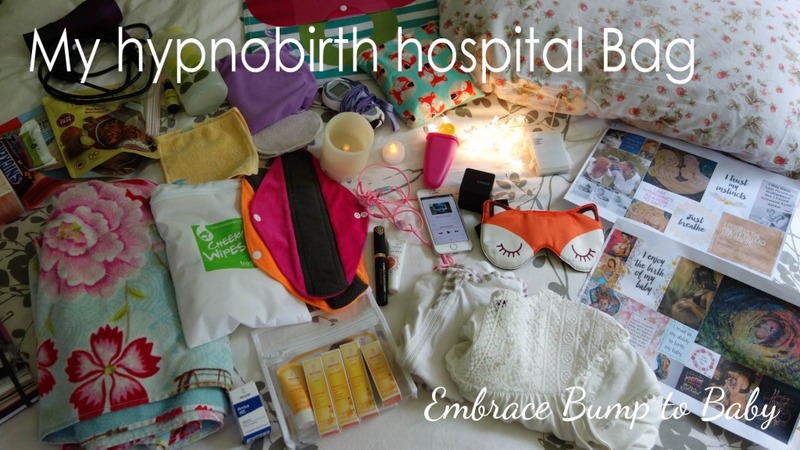 Check out my free online birthing course below to find out the techniques I was practising in the run-up to both labours.